Precision engineering is the discipline of designing a machine or instrument so it can maintain, measure, or move to a position or follow a path with a level of accuracy that is many orders of magnitude smaller than the size of the machine or instrument itself. Precision engineering is also the body of knowledge, wisdom, and techniques used to design such a machine or instrument. Precision machine design is typically concerned with using energy to produce a useful action or output with great precision, such as machining a part. Optomechanical engineering is typically concerned with holding optical elements in precise locations without distorting their optical surfaces. 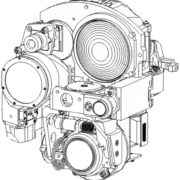 Motion can be involved either as an active function – such as in an optical zoom mechanism – or as passive compensation – such as in a lens that uses materials with different coefficients of thermal expansion to compensate for changes in focus with temperature (a form of athermalization). As described in Stiffness and Strength: Materials for Precision Machine Design, traditional mechanical engineering is the domain of stress and strength – will a thing break or permanently deform when subject to a given load? How can we optimize the design – in terms of cost, weight, or some other constraint – and still meet this requirement with an adequate factor of safety? Precision engineering is the domain of deflection and stiffness – will the relative position and orientation of features and components be maintained within acceptable limits when subject to a given load? Will local deformations, such as in the optical surfaces of a lens, affect performance? 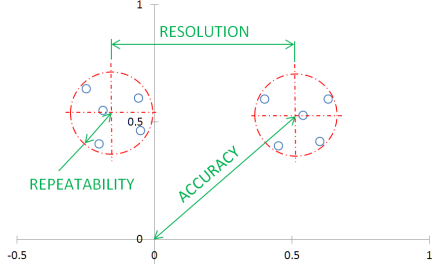 A boresighted telescope – Accuracy is the angular deviation of its optical axis from the theoretically perfectly aligned mutual axis. Identify an object of a given size from a distance of 1000 m using an infrared sensor. Illuminate that object with a minimum amount of energy from a laser. Permanently bond a stack of pre-aligned semiconductor wafers without disturbing that alignment. For these applications, defining performance, identifying the factors that contribute to it, and expressing the mathematical relationship between them may not be straightforward. But a clear understanding of this is critical to developing a successful solution in a cost- and time-effective way. The deterministic principle – Machines and instruments obey cause-and-effect relationships. With enough information about the system and the environment (and enough time and money in the project plan), we can calculate the effects of various loads and effects and compensate for them in the design and operation of the machine. This knowledge can be applied in the form of error models; error budgets; and error mapping and compensation. Kinematic constraint – Precisely and repeatably locating one rigid body relative to another using no more than six points of contact, without inducing distortion and allowing precision motion in the remaining (6 – N) degrees of freedom. 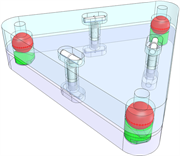 Counter principles – A theoretically perfectly symmetrical, perfectly formed, perfectly rigid machine has an elegance that one should not aspire to in engineering. All that perfection costs money. Sometimes, the most cost-effective solution is to introduce imperfection. Given the impossibility of achieving a perfectly formed, perfectly rigid machine, it may be better to introduce a small amount of controlled compliance into a system, in such a way that it will relieve stresses while minimally impacting performance. It is difficult to quantify what the “precision” in “precision engineering” means. While agreeing on a single definition isn’t critical, the guidelines from a number of experts offer valuable insights into the practice of precision engineering, including the effects that one must be concerned with. A ratio of the smallest change or uncertainty in the position or stability of one of a machine’s components to the overall dimension of the machine on the order of 10-6.
you are operating in the realm of precision engineering. At Practical Precision, we will explore these and other effects as well as how to eliminate, mitigate, or compensate for them in training courses and comprehensive articles like this one. Tooling and fixturing used in manufacturing (often in conjunction with automation and robotics) to improve throughput and yield. Interchangeability of design variations and of replacement parts, in production and in the field, for increased product flexibility, serviceability, and after-market sales and upgrades. Lack of access for service and adjustment in harsh and widely varying environments; the same techniques that ensure stability in a precision machine can be used to design a machine that tolerates a wide range of temperatures and other environmental effects over a long life, without maintenance. Anyone can design a bridge that won’t fall down. It takes an engineer to design a bridge that just barely won’t fall down. This saying is about having the knowledge to not over design a solution. About knowing the choices of materials and construction techniques available, and understanding the tradeoffs and effects of those choices. It’s about economics. 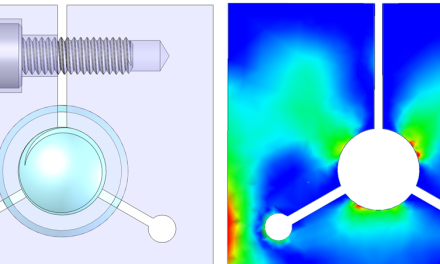 Whether or not a problem is a precision engineering problem comes down to whether or not the tools and techniques that constitute the practice of precision engineering are an economically advantageous way to achieve the design goals. The financial cost – of development, of production, of support – is a constraint just like accuracy, weight, or stiffness. Precision engineering itself provides a range of solutions for any given problem such as mount stability, from kinematic mounts to quasi-kinematic mounts to a simple set of three machined pads and reliefs separated by an adequate distance. Which is the appropriate solution depends on the application. Just as a mechanical engineer working with complex systems benefits from an understanding of electronics and controls engineering (and vice versa), an understanding of the principles of precision engineering and their application can benefit any technician, engineer, or manager involved in the development of complex systems.